A new study published in the Journal of Epidemiology & Community Health looked at the risk of dying for different age groups of Americans, and compared it to their retirement age. 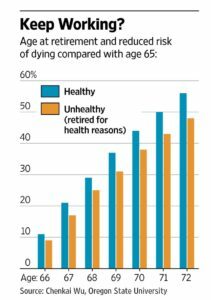 The researchers found that the likelihood of dying in any given year was 11% lower among people who delayed retirement for just one single year—from age 65 to age 66. By age 70, people who continued working experienced a 38% lower risk of dying than people of the same age who had retired at age 65. 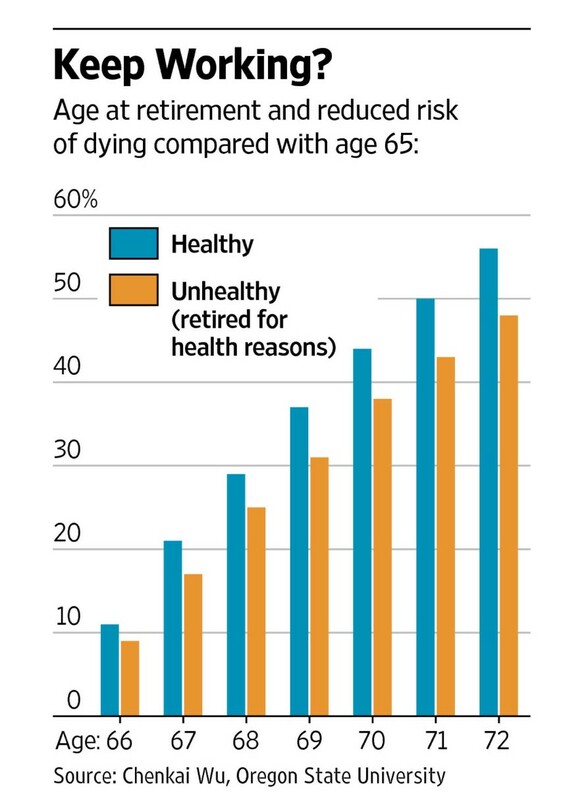 By age 72, the risk was 44% lower. These results seemed not to be affected by other variables, like gender, lifestyle, education, income and even occupation. Why is working longer good for your health? The article suggested that when you continue working, even part-time, your normal age-related decline in physical and mental functioning happens more slowly. You’re having to stay engaged in the complicated work-world, which keeps you sharp—and, apparently, alive.